A handsome Australian chef with a million-watt smile picks you up at a local supermarket, takes you home, and cooks for you. 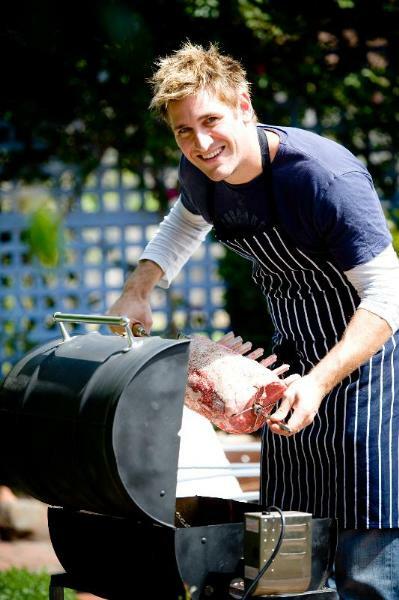 Curtis Stone: Oh that’s so cute! Where about is she based? CS: I was just in India not too long ago, out in Jaipur, Delhi…we went all over. BATF: Did you make any stops in Hyderabad? CS: No, we never made it out there! BATF: Well if you ever do visit, you have to try the biryani…it’s the best there! So, I wanted to ask you, what are some of your tips for healthy eating during the summer? CS: We’re in the middle of testing some summer recipes right now so I’ve been eating barbecue all morning [laughs]. During this time, some incredible in-season fruits like peaches, nectarines, apricots, and cherries. And when you think about fruit, healthy eating should start in the beginning of the day. Breakfast is a really important meal and that’s where a lot of people skip over. Protein’s so important and you can get that in different forms, like yogurt, and whole grains. That’s why I’ve teamed up with Great Grains cereal because it’s such a good way of getting a really nutritious start to the day. You can add some fresh fruit or just a add dollop of yogurt and turn that into a really nutritious breakfast. BATF: What are some of your favorite things to eat in the morning? CS: I try to vary it, depends on what I’m doing that day. I like to exercise in the morning so I eat something straight off the bat, whether it’s Great Grains, or some yogurt and fruit, and do some exercises. Then, afterwards I’ll have some protein. I kinda double up on breakfast. BATF: With the 4th of July coming up, do you have any grilling tips? CS: Make sure your grill is nice and clean well before you get to it and do as much prep beforehand. You’ll actually cook the meat on a grill for a very short period of time, so that’s why prepping is so important. I think the real trick to a great grill is applying some level of flavor before you start cooking, whether it’s a dry rub or wet marinade. I’ve got rosemary in my garden at the moment, so it can be as simple as rosemary, crushed up garlic or some olive oil. Or if you want to go to the effort of making a BBQ sauce, you can do that the day before as well. 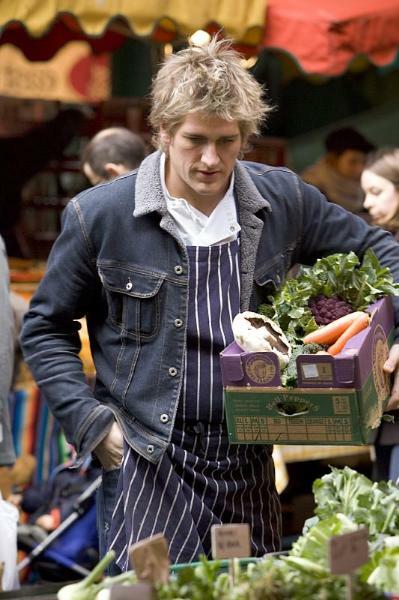 BATF: I know you like to focus on use local and organic as much as possible – where do you buy your food? CS: I’m lucky because we do a lot of recipe development we have a couple of great suppliers that will deliver to our kitchen, so I’ll steal some stuff from there sometimes. I also go weekly to Farmer’s Market in Hollywood that’s not too far from my home. But I think the key to sourcing good quality ingredients is making relationships from the people you’re buying from. That can be as simple as going to your local supermarket and saying hello to the guys who work in the fish department, and getting to know them and then asking, “What’s the freshest fish you got today?” They love giving advice. BATF: So say a guy is a novice in the kitchen, but really wants to impress a girl and cook dinner. What’s would be a good go-to meal to cook? CS: Good question — if I knew the answer to that I wouldn’t have been single for so many years! [laughs] I don’t think it’s so much about what you’re going to cook or how perfect it tastes, but how you pull the dinner off and how much effort you put into it. My opinion is, food is a very personal thing so if you could find out what her favorite ingredients are, or what she likes to order at a restaurant and incorporate that in the meal, you’re already ahead of the game. Go through that little bit of effort of setting the table beforehand and chilling some wine…you know, you don’t have to do it all cheesy, but just do those things ahead of time so you can still be a great host. Which means, you can still finish up dinner and be talking from the kitchen, but you’re not tied to the kitchen instead of being entrenched in the conversation. BATF: My blog is about beauty and food, so I have to ask you something beauty-related, since I ask all my makeup artists food questions! What do you use in your hair, because it always looks pretty awesome. CS: [laughs] You know, I don’t use a great deal. A little bit of hair clay, I think that’s what they call it. That’s about it. I guess that’s the beauty of having a messy haircut, right? You can’t really go wrong with it. [To answer your question, yes, it was definitely hard not to swoon over that adorable accent!] 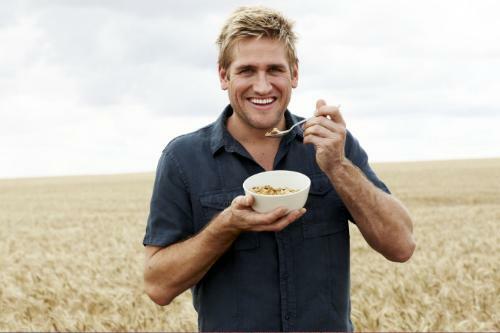 For some of Curtis Stone’s recipes and videos, visit his website at www.curtisstone.com.